In this topic you will learn how to monitor the social engagement performance of your videos using Brightcove Social. Dashboard - Provides a high level overview of video performance on social media accounts. For information, see Reviewing Social Analytics. 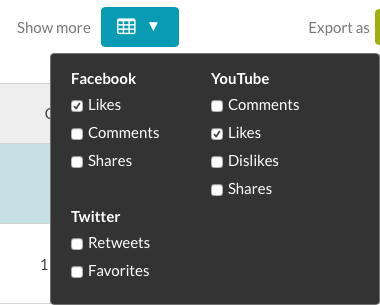 Social Views - Provides an overview of the social view for videos shared to social media accounts. For information, see Reviewing Social Views Analytics. Social Engagement - Provides an overview of the social engagement (Likes, Shares, Retweets, etc.) for videos shared to social media accounts. Covered in this topic. Start by selecting a time span for the report. To view the Social Engagement Analytics Report, click the Social Engagement tab at the top of the page. The Social Engagement graph will display the social engagement for the videos posted to your social media accounts for the time period selected. The Updated date is the latest date that Video Cloud has social analytics data for. Typically, there is a 24-48+ hour delay before social platforms update the views and engagement data in their APIs. Hovering over a line in the graph will display the data for that date. The YouTube views shown in the analytics reports are collected from the YouTube Analytics Overview report. YouTube does not guarantee that this data is real-time data. Therefore, you may see delays of several days before the views and engagement appear in this report. Once the data is in the YouTube Analytics, it will be picked up by the nightly data collectors for the Brightcove Social Analytics. If you need more recent real-time viewing data, YouTube also provides real-time reports with estimates of viewing data during the past 48 hours for your top 25 most recently published videos. You can find the real-time report for your YouTube channel here. Brightcove Social Analytics is not collecting this real-time data since it provides estimated views (as opposed to actuals) and only applies to recent videos. The Social View by Video section will display the detailed view data for each video. The column selector ( ) can be used to select the columns to display. The bottom of the report has controls which let you select how many rows should be displayed and for navigating to other pages. Report data can be downloaded as both comma separated values and Excel formats. Note that the export feature saves the data directly from an Analytics API call. The exported data is not manipulated the way the UI data is, and currently contains all of the underlying data in the report, not just the subset of fields the UI shows. Having all of the data in the original format from the API allows you to manipulate the data in ways other than what is provided in the UI.